Ardahan is one of the border provinces at the East Anatolia Region of Türkiye. In Ardahan under the effects of hard terrestial climate, winters are long and snowy, and summers short and cool. The studies made in the Ardahan Castle proved the traces belonging to the Earlier Bronze Age in the district. It was formerly called Artan. 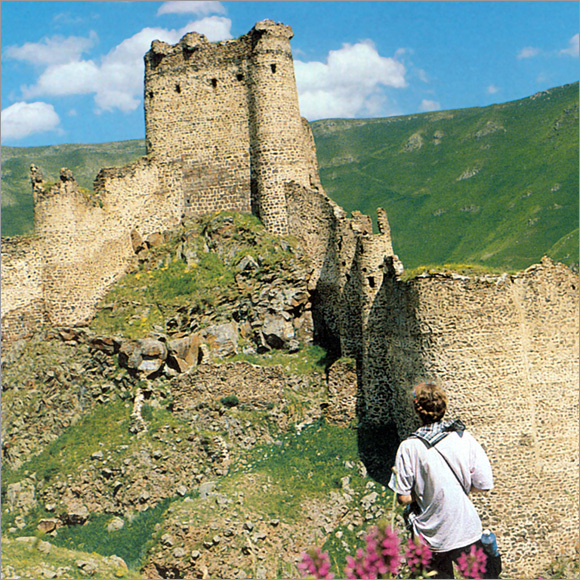 The Ardahan Castle protected the Ottoman territories against the attacks from Caucasia. According to the Treaty of San Stefano in 1878, the district given to Russia was retaken with the Treaty of Brest-Litovsk in 1918. Then, it was occupied by Georgians in 26 April 1919, and annexed to Turkish territories in 23 February 1921. The province of Ardahan became the 75th province of the Turkish Republic under the law issued in 27 May 1992. The districts of Ardahan (the centre), Cildir, Damal, Gole, Hanak and Posof. Throughout the city, there are fortresses with the characteristics of Urartu fortresses, churches like chapels built by non-Muslim citizens, historic mosques, houses with architectural characteristics peculiar to Ardahan and its surroundings, public baths, fountains, statues and figures with traces of several periods. The natural beauty arousing the highest interest among people is the silhoutte of Ataturk reflecting on Damal Daglari (Mountains). This interesting natural event on the sides of Karadag in the village of Yukari Gundes of the Damal district between the dates 20 June – 20 July of each year attracts great attention. it is famous with appearance silhouette of Atatürk on Damal Dağları (mountains) in the border of the province. Each year between the dates 20 June - 20 July silhouette of Atatürk appears at 18:05 after a few minutes, it removes. At that times Damal festival assembled at Ardahan by pursuing Atatürk on the shadows of his silhouette. The cuisine of the neighbourhood is excellen for people open to new tastes. Ardahan is famous for kashar cheese and honey throughout the country. Elma dolmasi, evelik asi, pisi, bozbas, kuymak, ekmek asi and helva are the most popular dishes in the neigbourhood. 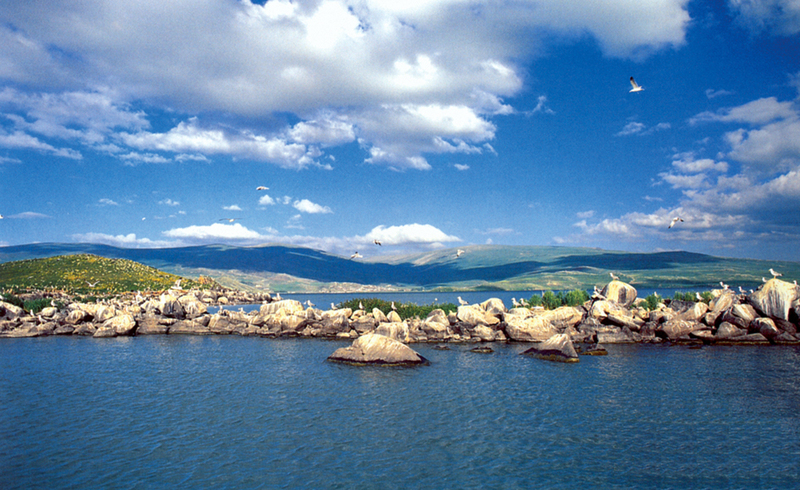 Akcakale Island, located in the Cildir Lake, is a first-degree archaeological protection area as well as its natural beauties. From the ruins found on the island of 2200 square meter and from the first surface researches, it has been understood that the first settlement on the island could date back to the Neolithic Stone Age (4000 B.C.) Today, one castle, one chapel, the ruins of one tower can be clearly seen on the island settlement. The city island located approximately 27 km southeast of the city centre of Cildir and hosting various kinds of birds in the month of spring is spectacular. These ruins, thought to be the oldest inscription in the region, is thought to belong to Sarduri II, one of the Urartian emperors. It is located on a large rock on the bottom cliff in the village of Taskopru, approximately 30 km south of the county borough of Cildir. The researches made in Ardahan Castle and its surroundings have showed that this is a settlement belonging to the Early Bronze Age ( 3500 – 2000 B.C). The Ardahan Castle was built by the order of Suleiman the Magnificent during the Ottoman Period ( in the middle of the 16th century) and managed to survive till today. The excavations made on the Ardahan Castle, whose history traces back to the ancient periods show that the district entered into the sovereignty of different kingdoms. The main gate of the castle similar to the classical Ottoman citadels is on the west and the entry gate has a high arch in eyvan (vaulted hall) style. On the entry gate is there a construction inscription with the date 963 of the Hegira. The walls forming a rectangular plan are thoroughly supported with a lot of square-based and polygon-planned towers. Inside the castle is there a mosque and bath ruins. The castle is located on a tongue-form and peaked hill surrounded by plateaues in three sides on the southeast of the Savasir (Cancah) village of the Posof district. The castle, whose exact building date is not known, is understood to have a tower built in the Middle Age. It is located on the north of the Bagdesen village, 30 km west of Ardahan. While the exact building date is not known, it is thought to have been built in the ancient periods because of its strategic location on an important passage. In terms of location and infrastructure, the castle resembles the Urartian castles; however, the castle with its height of about 130 m reminds of the chateaus in the Middle Age. It is located on a steep hill in the shape of peninsula, on the Plateau of Kura River in the Sevimli (Vel) village, about 18 km southeast of the county borough of Hanak. It is not known when the castle was exactly built and its architecture amended in time greatly, which remind of Urartian castles. It is founded on a steep field at a point where the plateau formed by the stream coming from the village intersects with the Kura Plateau, about 450-500 m south of the Kalecik village of the Gole district. It shows resemblance to the castles in the neighbourhood assumed to have been built by the Urartians. The castle is circumscribed with very steep rock cliffs from three directions. The castle located around the Yildirim village of the Cildir district is assumed to have been built in the Middle Age. The castle was built on a highlt steep field. In the historical records, this castle has been named such as Cildiran Castle, Kal’a-i Seytan, Kacis, İblis Hisari. The castle is located on a steep peninsula circumscribed by Karacay running on a channel highly deep on three sides, which turns it into a fortified place hard to capture. The surroundings of the rocky area is encircled by the walls of about 2 m at height. There is one chapel and water cistern within the walls of the castle. Seytan Castle is one of the most important castles in the neighbourhood. The castle was used as a settlement area for various civilizations chronologically such as Med, Pers, Roman, Sasani, Seljuks, İlhanli, Safavi, Ottomans, and a number of repairs and supplements was made to the castle during these periods. It is located on the border of Georgia and 1 km south of the Kurtkale subdistrict about 36 km northeast of the county borough of Cildir. There is no exact information about the history of Kurtkale giving its name to the nearby subdistict and about how it was named after. It show similarities to the Seytan Castle in terms of location and architecture. According to the people in the neighborhood, the castle was named after the wolf figure at the north gate. The castle is understood to compose of one interior and one exterior castle. In terms of location, Kurtkale is thought to have been a defense structure built to take the border into security and to have served as an advanced post. There is a hidden waterway ensuring the connection of the castle with the Kura river. Also, there are a chapel with a gate and a little apsis, water cistern, bath ruins. It is located on a tounge-formed ridge circumscribed by the plateau, on the right according to the course of the river on the Kura Plateau, approximately 12 -13 km northeast of Ardahan. Around the castle whose date is not known, there are the traces of settlement. The tower in the eastern direction has only survived till today. The tower of 15 m at height has been understood to have been built by the Turks known to originally come from the Kazan region in Turkistan and live in this neighborhood in the 8th -9th A.D. centuries. It is founded on a peaked hill east of the Altas (Ur) village, at the 18th kilometer of Ardahan – Hanak highway. In the historical records, only the name and the place of the castle can be found. It is not certain when the castle was first built, but the castle has been known from the 7th and 8th centuries on. There are the traces of old settlements around. It is located on the bank of Hanak Brook on the Ardahan-Hanak highway, west of the Cayagzi village 5 km south of the Hanak district. The exact date of building is not also certain for this castle. However, it is interesting that the existing ruins have the same wall technique as the ruins belonging to the Ardahan Castle. The castle located on a low hill has pretty high trunk walls. There are 2-3 more castle ruins in a smaller scale, periodically built on the hills ranged south of this castle. The castle ruin is located on a low hill on the ridges of the Dedesen village of the Gole district. There are data showing that the castles have been a Turkish settlement area from the Seljuks on. The name of the Dedesen Village in which there is a tomb dating back to the 15th century has never been changed till today since the Caldiran war of Selim I. The walls of the Dedesen village, one of the biggest castles in terms of its total area, are wide as to include the northern parts of the village today. There have been found leaning ram sculptures devastated in the castle settlement. At the same place with these ram sculptures, on the side overlooking the village, there is also a gravestone in the shape of a horse whose head was devastated, which shows that Turkmens have settled here since the ancient periods. Cak Castle, Mere Castle, Kol Castle, the Castle of Olcek Village, Karakale nearby Cildir, Kislahanak (Avcilar) Castle, Karakale nearby Hanak are worth mentioning. In Ardahan, there are towers as well as castles. Among these towers which have survived till today but in ruins can be considered Ziyaretdere Tower, Tepeler (Konk) Village Tower, Yigit Konagi Village Tower, Cakildere Village Tower, Ugurlutas ( Dort Kilise) Village Tower, Uguz (Maglisa) Mountain Tower. It is located 200 m east of the castle in the city centre of Ardahan. It is written on the inscription on the main gate that it was built in 1701. The mosque has been recently restored. The minaret with a single minaret balcony and a cylindrical trunk on a cubic pedestal has been added to the mosque during the last restoration. In the courtyard is there a fountain stone with inscription declared to be brought from the Arap (Yanik) Mosque. The date of 1871 is written on the inscription on the stone. It is in the county borough of Posof. It is understood according to the inscription on the pulpit that the mosque was built in 1868. The mosque made of free stones has a rectangular plan, which is also close to square. The interior structure reflects the Ottoman architecture. The date of 1771 is written on the sarcophagus east of the mosque, which make us think that the mosque’s history dates back to the older periods than the pulpit’s. The mosque is illuminated with six windows. It is located in the city centre of Ardahan. The mosque existed until the massacre of the Armenians against the Turks in the neigbourhood since 1915. During the massacre starting in 1915, the mosque was burnt together with Muslims who escaped and took shelter in the mosque. The building known as the Arap Mosque till today have been devastated and stayed in its ground form. A part of the mosque, which has lost its whole meaning, is used as a park area and publicly known as the Yanik Mosque. The mosque in the city centre of Ardahan was built in 1711. The mosque is exposed to light from four embrasures. On the board below the embrasure window in the southwest corner and on the west corner is written that the mosque was restored in 1897. The mosque is the second oldest building surviving in the neigbourhood, after the Mosque of the Dedesen Village. Other mosques in the neigbourhood are Dervis Bey Mosque, the Mosque of Olcek Village, the Mosque of the Dedesen Village, Golbelen (Urta) Kilise Mosque, Kayabeyi (Yerli Cayis) Kilise Mosque. There are a lot of churches around Ardahan. Some of these are the Church of Olcek Village, Ovundu (Vaslop) Monastery Church and Chapels. In addition to its nature and its climate peculiar to East Anatolia Region, Ardahan shelters different beauties with the transition to the topography, the climate and the flora of the Eastern Black Sea Region. Ardahan with its high plateaus, its rich kinds of flowers, its uplands and its two lakes is a nature’s paradise waiting to be discovered. They are nearby the Ovundu village, 1 km east of the Kurtkale subdistrict of the Cildir. The caves are two settlement areas of two groups formed by hollowing of a rock mass with limestone. There are many cave settlements and a big rocky church on the rock cliff in the Kura River Plateau in the Ortakent (Buyuk Nakala) subdistrict 10 km east of the Hanak district. In the historical records are written that the settlement group of this cave have the traces of the Paleolithic Period like the Tahtali, Vaslop, Ampur, Colit Caves in the following periods. Yalnizcam Uplands is 15 km of Ardahan. Bulbulan and Botanic Uplands are fascinating as much as Yalnizcam Uplands. Gole Okcuoglu Uplands also attracts attention with its wild life. It is located 45 km east of the city centre and at the altitude of 1.959 m. The lake on a field of 123.000 square meters is the second highest lake of the East Anatolia Region after the Van Lake. The Cildir Lake is magnificent with its island, its birds and its fishes. The lake with its natural beauties and historical works around has a crucially high potential in tourism. There are 16 kinds of fishes in the lake. You can witness interesting scenes when people ride on horse sledges and do fishing by breaking the ice when the lake surface is covered with ice in winters. 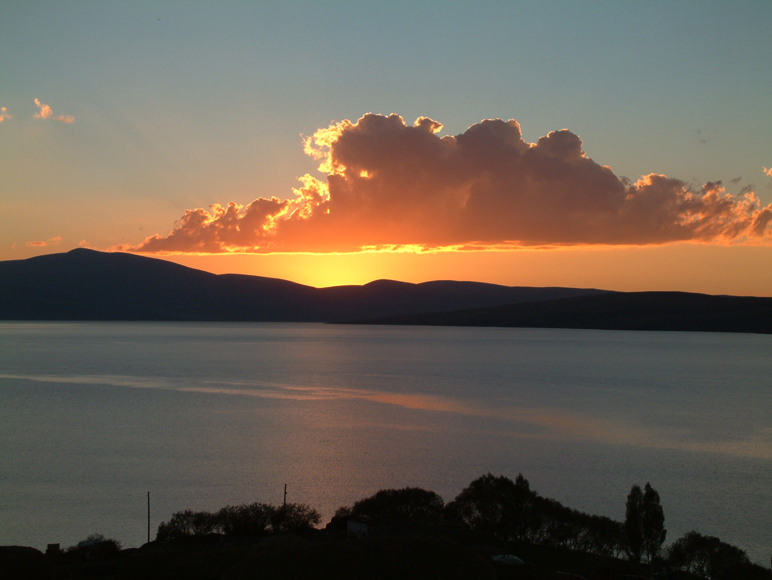 Apart from the Cildir Lake, Aktas and Aygir Lakes are also the heavenly spots of the neighbourhood.